ISLAMABAD, Apr 23 (APP): Justice Mian Saqib Nisar has taken oath as Acting Chief Justice of Pakistan here on Saturday. The oath was administered by Justice Asif Saeed Khan Khosa in a simple but dignified ceremony in the Supreme Court. Justice Mian Saqib Nisar will act as Chief Justice of Pakistan during the period, Chief Justice Anwar Zaheer Jamali remains abroad. 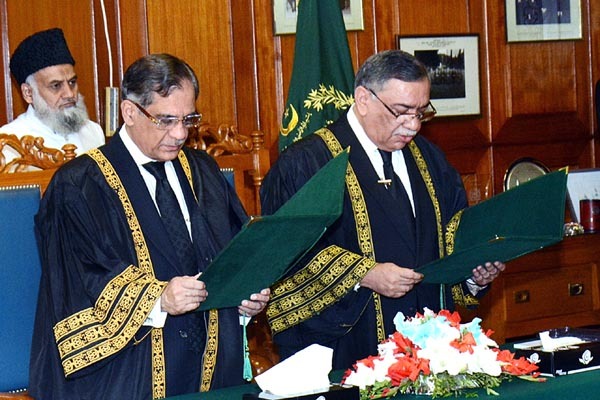 The ceremony was attended by Judges of the Supreme Court of Pakistan, Chief Justice and Judges of Federal Shariat Court, Chief Justice and Judges of Islamabad High Court, Attorney General for Pakistan, Senior Lawyers and Officers of the Federal Judicial Academy and Law & Justice Commission of Pakistan.